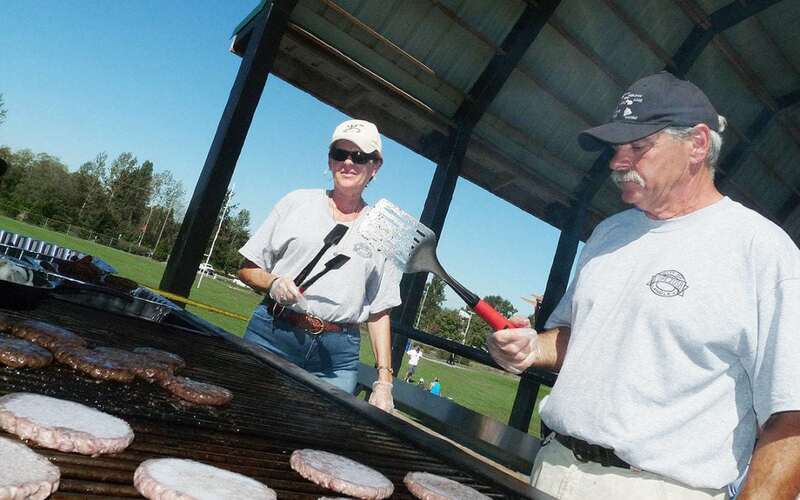 A fundraising barbecue for hungry students was held Saturday at Willoughby Community Park in Langley Township. The event was staged by CUPE Local 403, which represents municipal workers. Union president Debbie Whyte said after an impressive presentation by the student organizers of the Weekend Fuelbag program that provides meals for students-in-need outside regular school hours, the union decided to help by turning its annual membership barbecue into a fundraiser. Fuelbag organizer Brady Lumsden, a Grade 11 student at Walnut Grove Secondary, was pleased with the response to the event, which was open to the general public at Willoughby park. Lumsden and two cousins, Katrina and Emma Schulz, started the program last year. By the end of the school year, it was helping 80 students at nine schools. This year, Weekend Fuelbag plans to expand to Aldergrove Secondary within the first two months of the school year. The program will also operate in Surrey, in Fleetwood Park, helping eight students and organizers hope to convince other schools and other communities to join in, Lumsden said. “We’ll expand to other cities and make sure we get as many kids and as many students as we can,” Lumsden said. Last year Lumsden and his cousins packed all the bags, but since the cousins have moved away from Langley, he’s planning to have students in individual schools take on that task. “It’ll be neat having kids within the school helping their peers, but it will still be completely anonymous and nobody will know who is in the program except the counsellors. For this year, it was estimated the program would need about $24,000 to help purchase supplies in addition donated food, but because some donors have had to cut back, the amount needed has increased to $36,000. Lumsden said the program has raised about $30,000 and is optimistic the rest can be found. The event in the park next to the Langley Events Centre on 200 Street included a prize table set up for raffle prizes as well as some live entertainment. The student-led initiative, that helps Langley students-in-need with weekend food started in September 2016, helping 16 middle and high school students at R.E. Mountain and Walnut Grove, as well as at Yorkson Creek Middle School. Students in the program are given bags every Friday that contain two breakfasts, two lunches, drinks and snacks to tide the students over the weekend. The bags are picked up confidentially at the schools. When it looked like the program might come to an end because a major sponsor was closing, a public appeal by the students saw new sponsors step up, allowing the program to expand to other schools, helping more than 70 students at eight middle and secondary schools in Langley.